Issues: Rewrite BBS "Settings and Areas" section; make sure to have the three distinct Rainbow Falls: Base, Crest and Ascent. Neverland, sometimes parsed as Never Land, is a world that appears in Kingdom Hearts, Kingdom Hearts Chain of Memories, Kingdom Hearts 358/2 Days, Kingdom Hearts coded, and Kingdom Hearts Birth by Sleep. It is based on the 1953 film, Peter Pan. Although the world is named Neverland, the actual islands are only visited in Kingdom Hearts 358/2 Days and Kingdom Hearts Birth by Sleep; in Kingdom Hearts and Kingdom Hearts Chain of Memories, Captain Hook's pirate ship and London's "Big Ben" clock tower are explored instead. 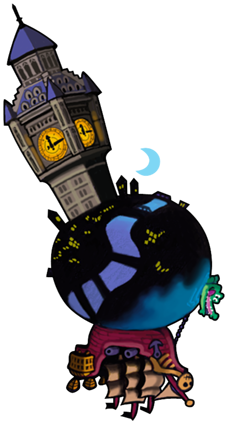 Neverland's Keyhole is at the thirteen minute point on Big Ben's clock face, and appears when the hands point at twelve o'clock. Neverland is explored fully and freely compared to its previous incarnations. In the center of the island is the Gully (渓谷, Keikoku? ), which leads either to the Indian Camp (集落, Shūraku?, lit. "Settlement"), the Jungle Clearing (ジャングル, Janguru?, lit. "Jungle"), or the Rainbow Falls: Crest. Peter's Hideout (ピーターの隠れ家, Pītā no Kakurega?) can be accessed by entering the tree in the Clearing. Past that is Mermaid Lagoon (人魚の入り江, Ningyo no Irie?, lit. "Mermaid Cove"). Taking the path on the right will lead along the Seacoast (海岸, Kaigan?) to the Rainbow Falls: Base (虹の滝:下部, Niji no Taki: Kabu?). Going up from the base will lead to Rainbow Falls: Ascent (虹の滝:頂上, Niji no Taki: Chōjō?). Going up again, will lead back to Rainbow Falls: Crest (虹の滝:中部, Niji no Taki: Chūbu?). This path will lead back to the Gully. The left path from the Lagoon leads along the Cliff Path (崖道, Gakemichi?) to the Cove (岬, Misaki?, lit. "Cape"), and finally to Skull Rock: Cavern (ドクロ岩:中, Dokuro Iwa: Naka?, lit. "Skull Rock: Inside"). 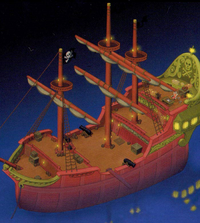 Sora and his party's first stop in Neverland is in the Brig of Captain Hook's ship, where they meet with Peter Pan. Eventually, they bust out and enter the ship's Hold (船倉, Funagura?). Activating the Yellow Trinity on the left opens a small Secret Room, while the right door leads to a hole into the ship's Freezer (氷蔵室, Hyōzō-shitsu?, lit. "Ice Storage Room"). Traveling through the Freezer takes Sora's party to the Galley (台所, Daidokoro? ), just below the place where Wendy and Kairi are held prisoner. Climbing through the grate in the corner takes the party to the Cabin (船室, Senshitsu? ), which holds a save point, and a Green Trinity that lowers the ladder and allows them to access the Captain's Cabin (船長室, Senchō-shitsu?). Alternately, the party can pass through the Corridor and go right into the former holding cell for Wendy and Kairi, where the Captain's Cabin can also be accessed. 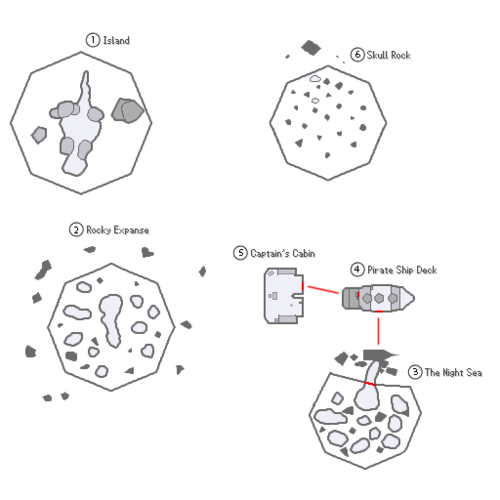 After the boss battle in the Captain's Cabin against AntiSora, the party can travel out on Deck, where the final battle in Neverland takes place. Afterward, Peter Pan and Wendy take the party to the Clock Tower (時計台, Tokeidai? ), the site of many treasures and the world's Keyhole. Roxas first arrives in Neverland on the Island (小島, Kojima?, lit. 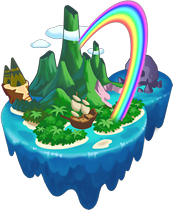 "Islet"), one location in which Captain Hook is digging for treasure. Captain Hook and Smee are next seen at the Rocky Expanse (岩場, Iwaba? ), still searching for treasure. During nighttime, the Rocky Expanse is labeled The Night Sea (夜の海, Yoru no Umi?). The Pirate Ship Deck (海賊船(甲板), Kaizoku-sen (Kanpan)?, lit. "Pirate Ship (Deck)") and Captain's Cabin (船長室, Senchō-shitsu?) locations are only accessible during the night. The final place available is Skull Rock (ドクロ岩, Dokuro Iwa? ), where Pete summons the Ruler of the Sky on Roxas's last story-oriented mission. Mickey finds himself in Neverland, and while exploring the Indian Camp, he stumbles upon Vanitas, who abducts him to the Keyblade Graveyard. Ventus arrives at the Seacoast and falls asleep while resting. He wakes up when the Lost Boys and Tinker Bell find him, and Tinker Bell tries kicking him awake. When they head off to find a shooting star that Tinker Bell saw, he tags along. In the meantime, Terra arrives at the crest of the Rainbow Falls, where he finds Captain Hook and Smee being attacked by Unversed. After Terra defeats the Unversed, Hook tells Terra of a young boy who is trying to steal the "light" inside Hook's chest. Terra agrees to help keep the chest safe from Peter Pan, and the three head to the Cove, where they take a boat to Skull Rock. Hook leaves Terra inside the Cavern to guard the chest, while he and Smee go after the shooting star, which Hook hopes to be treasure. When Ven, the Lost Boys, and Tinker Bell meet up with Peter Pan at the Jungle Clearing, he and the Lost Boys head off in search of pirate treasure, while Ven and Tinker Bell continue looking for the shooting star. They arrive at the Indian Camp, where they find Mickey's Star Shard, but Hook takes it and kidnaps Tinker Bell. Hook demands that Peter Pan meets him at Mermaid Lagoon and runs off, leaving Ventus to fight off a group of Unversed. Back at Skull Rock, Peter Pan distracts Terra while the Lost Boys go after Hook's treasure chest. They drop the chest in their escape, and Terra is surprised to find that the chest contains pirate loot. He apologizes and tells Peter where Hook went, and Peter rushes off to save Tinker Bell, leaving the Lost Boys to watch the chest. As Terra leaves, the Boys are attacked by Unversed, and Terra returns to take them out. The Boys hide when Hook returns with the captured Tinker Bell, who Terra frees. Hook runs off at the sound of the Crocodile. Before leaving, Terra tells the Lost Boys to put their precious possessions into the now-empty chest. Ventus meets up with Peter Pan at the Gully, and they head for the Mermaid Lagoon, where they are fired upon from Hook's ship. Tinker Bell catches up with them during the chaos, and Peter takes her to stop the cannon fire while Ven goes after Hook, who he finds in the Cove. Hook is enraged to discover that Peter survived, and he takes on Ven while the Crocodile circles them in the water. When Hook is defeated, he falls in the water, and the Crocodile chases him away. Peter arrives with the Lost Boys and their empty treasure chest. Slightly suggests they put their own special possessions in the chest, and Peter Pan agrees. Ventus puts his cherished wooden Keyblade in the chest. He takes the recovered Star Shard from Tinker Bell, and it quickly whisks him away to the Mysterious Tower. Aqua is the last one to arrive. She meets Peter Pan, Tinker Bell, and the Lost Boys. They tell her that because she found their treasure map, she has to be the leader and go on their treasure hunt with them. They soon find out that Captain Hook stole their treasure once again, realizing that it was all junk in the chest he abandons it and leaves. Aqua finds the wooden Keyblade and Peter tells her Ven left it behind. She then senses another presence nearby and runs to the Indian Camp only to be confronted by Vanitas who is holding Ventus's wooden Keyblade. He then tells her that Ventus no longer needs it, and callously snaps it in two, much to Aqua's outrage. He then proceeds to tell her that since Ventus has gotten stronger, he no longer needs her as his so-called "Plan B". Aqua then battles and defeats him in a fight, but passes out soon afterwards. She is then awakened by Peter where she talks a bit about Ven and Terra. She departs soon after. Some time after Master Xehanort's defeat, Peter Pan, Tinker Bell, and the Lost Boys get their treasure back, and when Peter discovers that Hook and Smee are watching them, he flies over and steals Captain Hook's hat. Once Riku has captured Jasmine, Maleficent reveals Kairi's whereabouts. Wishing to wake up Kairi, Riku goes to Monstro and attempts to steal Pinocchio's heart, but his plan is foiled by Sora, and he returns to Captain Hook's ship, where Kairi's lifeless body now lies. Maleficent meets him there, and gives him the ability to control the Heartless. Later on, Sora and company are captured by Captain Hook, and they encounter Riku, who explains that while Sora was off goofing around he has been able to find Kairi. Riku, demonstrating his newfound powers, creates AntiSora before Sora falls through a trap door. Below deck, Sora, Donald, and Goofy meet Peter Pan, who is trying to rescue Wendy, who is being held on the ship. They traverse through the ship, eventually fighting off AntiSora and finding Wendy, and Peter flies off with Wendy. In the meantime, Riku escapes with Kairi, leaving Captain Hook to fight Sora and Peter Pan, who returns after taking Wendy to safety. Captain Hook is thrown overboard by Sora and Peter Pan, and he is chased towards the horizon by the Crocodile. Peter Pan and Tinker Bell take Sora to the Clock Tower, where Wendy is waiting. Sora repairs one of the clock faces, which reveals the Neverland Keyhole. Sora seals it with his Keyblade, and bids farewell to Peter Pan, but not before Peter asks him to look after Tinker Bell, who becomes one of Sora's summons. When the Final Keyhole is completed at Hollow Bastion, several powerful Heartless escape. One of them, the Phantom, finds its way to the Clock Tower. When Sora returns to Neverland, Tinker Bell asks for his help in defeating the powerful Heartless, and takes him to the Clock Tower. After a long and difficult battle, the Phantom is finally defeated and Neverland is safe again. Inside Castle Oblivion, Riku enters a replica of Neverland. During his exploration of the memory replica, he encounters Hook, whom he soundly defeats. Later, Sora and company enter the memory-based Neverland, where they learn that Hook has captured Wendy as bait to lure Peter Pan to his doom. Sora, Donald and Goofy meet Peter and decided to help him rescue her. However, when Wendy tells Peter that she wishes to return to London, even if it means growing up, he leaves. Forced to save her themselves, Sora and company get outside the ship and meet Captain Hook, who has forced Wendy onto the plank. However, before he can make her jump off, Peter returns and rescues her. After the defeat of Captain Hook, Sora and Wendy encourage Peter to believe that, even though people forget memories when they get older, they can still remember them when the time is right. Roxas and Axel are able to fly thanks to Tinker Bell. Roxas is ordered to venture into Neverland for the first time on Day 174 in order to take down a Wavecrest. Once there, he encounters Captain Hook and Mr. Smee, both of whom are looking for buried treasure following a pile of maps. The treasure they had recently found, similar to a dozen or so they had dug up prior to Roxas's arrival, is empty. Hook becomes frustrated with their lack of success and believes someone else might get the treasure. Heartless appear a moment later, drawn by Hook's greed. The Captain and Smee flee at the sight of the Heartless, leaving Roxas to eliminate it. Roxas then turns to inspect the "treasure", and is rather confused at the Heartless' appearance next to it. He suspects Hook had something to do with the Heartless emerging, as his rising emotion made him seem "off". Wanting to further inspect what happened, he approaches their ships. Tinker Bell then flies along, and Roxas experiences another vision of the boy in red who had apparently met Tinker Bell before. She urges him to follow her to the ship, and as Roxas lacks the ability to fly, she grants it to him. Roxas believes he can fly, and a vision of the boy in red comes to him showing him how to do so. The sensation is curiously enough familiar to Roxas, like it wasn't the first time he flew. It also seemed like Tinker Bell believed in him, as though she knew he'd be able to fly with her help. Despite this, Roxas decides to follow his orders and not follow Tinker Bell to Hook's ship. He completes the mission and is anxious to share with Axel and Xion the things that transpired. On Day 195, he is accompanied on a mission to Neverland by Axel. When Roxas is unable to fly, he soon realizes he needs Tinker Bell's help. Axel and Roxas notice Hook and Smee nearby, digging up more Heartless infested chests. They retreat to the ship and decide to fire the cannons. Roxas tells Axel about what he knows of Hook and Smee's story, and they decide to check the spots already dug at in the hopes of finding their targets, Artful Flyers. They find Tinker Bell at the site, who is angry at Roxas for not helping her out before. She decides eventually to help the two fly in the hopes they would help her. In an attempt to follow Roxas's example, Axel tries to fly but fails. Roxas encourages him, and because he believed in his friend's words, Axel becomes able, much to his own surprise and excitement. Axel then stops Roxas from following Tinker Bell, and the two go about completing their mission while dodging cannonballs shot from Hook's ship. Once the mission is over, Axel and Roxas return to the Castle That Never Was, just in time to miss Pete's entrance to world. It seems the maps Captain Hook found were placed by Pete in order to fuel the Captain's greed, and by doing so, Pete could rally an army of powerful Heartless drawn to that greed. He doesn't obtain the Heartless though, as they were eliminated by Axel and Roxas. On Day 300, Roxas finds his appointed mission a bit more difficult, for he cannot fly, and Tinker Bell has been captured by Captain Hook and Smee. Helping the one that helped him earlier, Roxas decides to not complete the mission until Tinker Bell is safe. 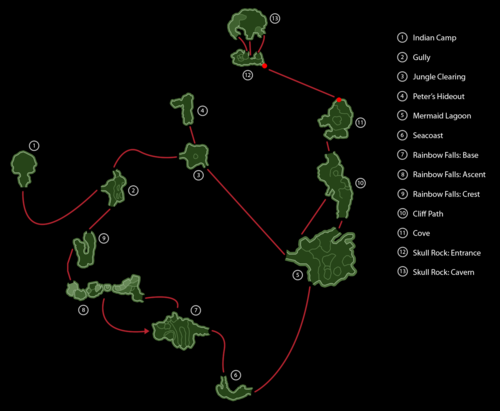 Hook has apparently been tearing apart every map that proved to be useless before heading on to the location shown on the next map. He believes that amongst the fake maps is one that leads to a real treasure, and that the "dummies" were a means of protecting it. Therefore, if he kept making Smee dig, he would get his treasure. Roxas finds that Tinker Bell has been locked in a lantern on Hook's desk, so he hides and waits for Smee and Hook to leave before he sets her free. After he releases her, Roxas turns away in order to return to his mission, only to be stopped by Tinker Bell. He then gets a momentary vision of the boy in red, which convinces Roxas stay with Tinker Bell for a while longer. They discover the map pieces Hook no longer had interest in, and Tinker Bell helps Roxas fly once more so he could look into the spots marked on the maps. Roxas collects the rest of the pieces from across the ship and digs at the appointed spots, but does not find any Heartless. He realizes Hook was the one who drew the Heartless, so he tracks him down. Upon finding Hook, the Phantomtail Roxas was sent to exterminate appears. Pete appears just as Roxas leaves again and reaches the conclusion that despite how much Hook has been digging, there aren't Heartless nearby because someone was eliminating them. Pete then decides to turn to his final resort, offering Hook a real treasure. This makes Hook's greed grow, allowing Pete to summon a Heartless to fight. The final battle in Neverland takes place on Day 301, where upon arrival Tinker Bell rushes to Roxas's side and grants him flight in order for him to reach Hook and Smee. The two are digging up the "treasure" buried where the last map they have led them to. True to Captain Hook's suspicions, the final map led them to a decorated treasure chest filled with valuables and several weapons made of solid gold. Hook's greed grows and is absorbed into the treasure, giving birth to the skeletal dragon Heartless fittingly named Ruler of the Sky. Hook and Smee run away, thus clearing the stage for Pete to make his entrance. Enraged at Roxas's interference with his plans once more after what happened between them in Agrabah, he commands the Ruler of the Sky to attack Roxas. After the battle, the defeated Heartless crashes into Hook's ship and destroys it, much to Tinker Bell's amusement. The Ruler of the Sky's captive heart is then released. Pete, enraged at his defeat, escapes the scene, and Roxas is free to leave Neverland. Neverland is shown several times during Roxas's dreams. 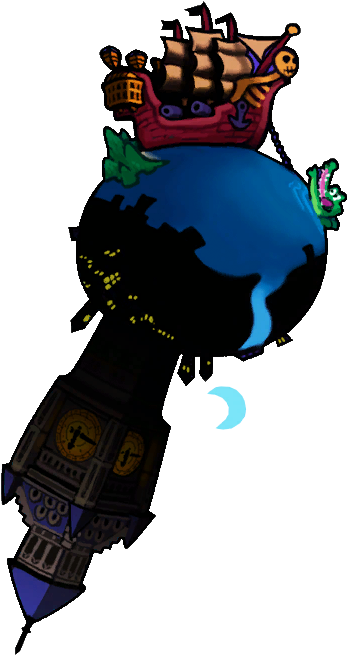 After discovering Data-Riku in the Destiny Islands room of the Datascape's Castle Oblivion, Data-Sora is shown a memory of Riku looking up at the moon on top of the Clock Tower. He reaches out, pretending to grab at the moon before looking back at a catatonic Kairi. The other Lost Boys, Nibs, The Twins, and Toodles, appear in the manga adaptations for Kingdom Hearts and Kingdom Hearts 358/2 Days. Captain Hook's pirate crew and the mermaids appear in the manga adaptation for Kingdom Hearts 358/2 Days. ↑ Aqua's role as Peter Pan's and the Lost Boys' "mother" during her visit to Neverland in Kingdom Hearts Birth by Sleep mimics the role Wendy plays in the Walt Disney film.